Looking for something to go with a baguette? 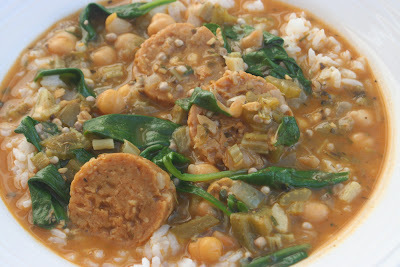 Try this gumbo! 1. Grind thyme, bay leaves and pepper flakes with a mortar and pestle. Add garlic cloves and mash with spices. Add with other spices listed above, and make 4 sausages as usual. 1. Heat margarine and oil in a large pot over medium heat. Add flour and stir constantly for about 5-7 mins, until flour turns a caramel colour. Add onions, celery, and green onion and fry for 5 mins. Add okra and garlic and cook 1 min. Slowly add in 7 cups of water. 2. Add sliced sausage, bay leaves, soy sauce, hot sauce, cayenne, and salt and pepper. Bring to bubbling, then simmer for 50-60 mins, adding more water if it gets too thick. 3. Add in baby spinach, green onions, parsley, paprika, thyme and basil. Cook 5 mins. Adjust seasonings and serve in a bowl over rice.